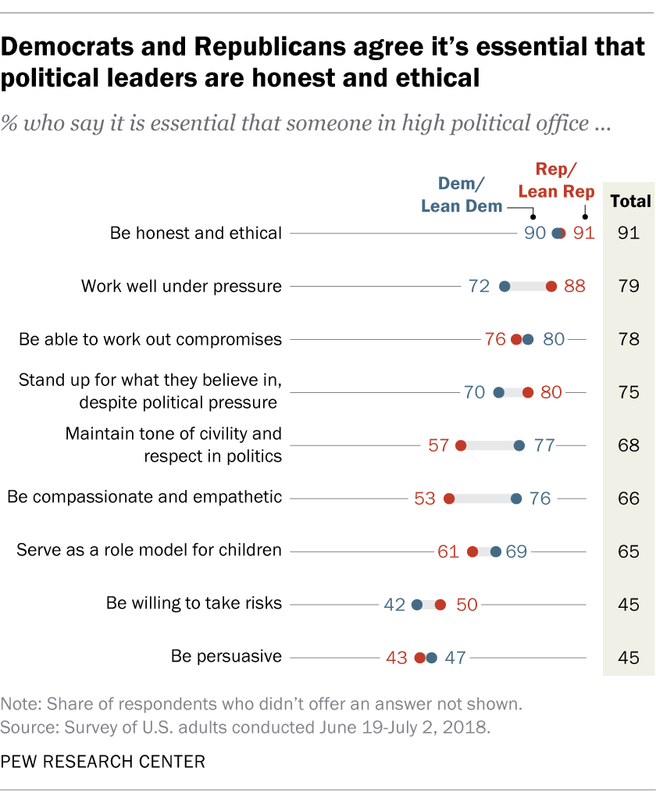 Democrats and Republicans overwhelmingly agree that political leaders should be honest and ethical. 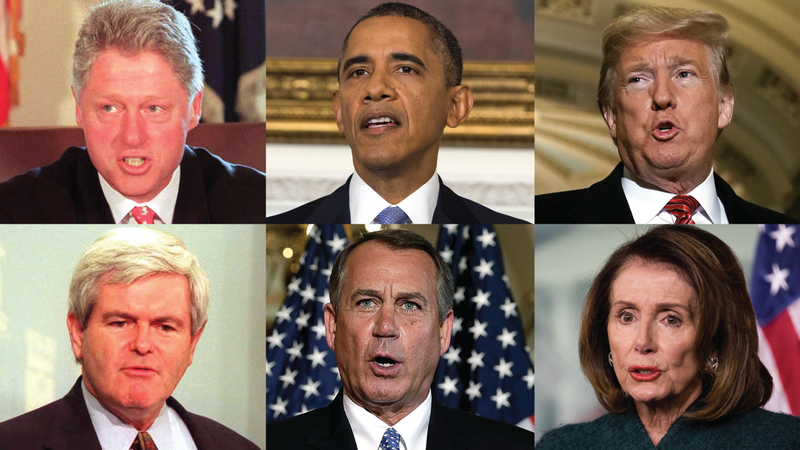 There is far less common ground among partisans over whether particular leaders – including President Donald Trump – display these qualities. In a Pew Research Center survey conducted last summer, 91% of Americans said it is essential for someone in high political office to be honest and ethical – the top attribute out of nine asked about in the survey. There were no partisan differences in this assessment: Nearly identical shares of Democrats and Democratic-leaning independents (90%) and Republicans and Republican leaners (91%) said this. There were partisan differences over whether several other qualities – such as maintaining a tone of civility and respect and working well under pressure – are essential for political leadership. While partisans agree about the importance of political leaders’ honesty and ethical behavior in general, they disagree sharply when asked about honesty and ethical behavior in the context of Trump and his administration, as they have for other elected officials. Americans have mixed expectations for the year ahead: 47% say they expect 2019 will be better than 2018, while 43% say it will be worse. Last January, the public had a more optimistic view of the coming year, with 61% saying 2018 would be better than 2017. The Pew Research Center survey, conducted Jan. 9-14 (before the partial shutdown of the federal government ended), finds that expectations for the year ahead have declined among members of both parties. As has been the case since Donald Trump’s election, Republicans are far more optimistic than Democrats about the coming year. Seven-in-ten Republicans and Republican-leaning independents (70%) say 2019 will be better than 2018. By comparison, just 32% of Democrats and Democratic leaners say they expect this year to be better than last year. But members of both parties – particularly Republicans – are less optimistic than they were about 2018, when 88% of Republicans and 42% of Democrats said the year ahead would be better than the one that had just ended. The last Congress was the first one in more than a decade in which Republicans controlled both the House and Senate while a president of their own party sat in the White House. 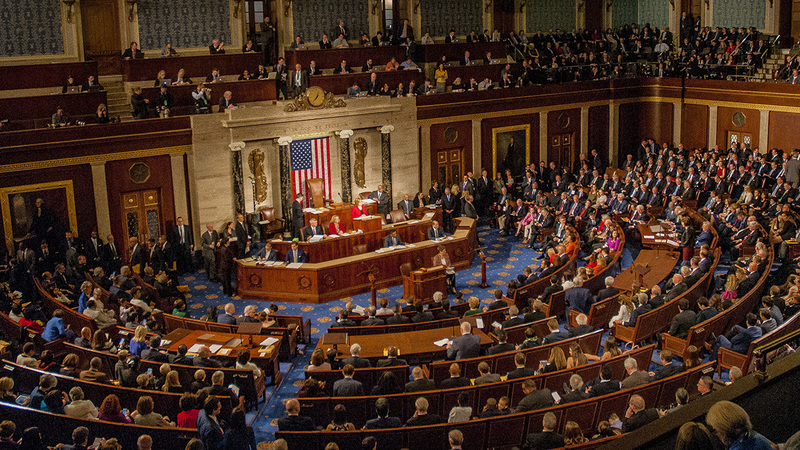 And while the 115th Congress was more legislatively active than its recent predecessors, the proportion of substantive to ceremonial legislation was much the same, according to a Pew Research Center analysis of U.S. congressional data. 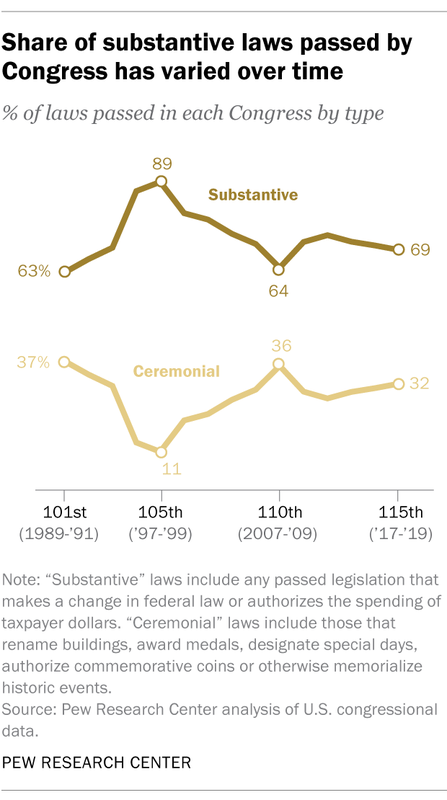 Nearly a third of the laws passed by the 115th Congress were ceremonial in nature; it was the third Congress in a row in which the ceremonial share increased. Those ceremonial measures include 109 that renamed post offices, courthouses and the like – a fourth of the Congress’ total legislative output. Whoever emerges from Venezuela’s political turmoil to rule the country will face a public that doesn’t trust its national government and continues to experience deep economic hardship and deprivation, according to a new Pew Research Center survey conducted from Sept. 12 to Dec. 7, 2018. Earlier this week Juan Guaidó, leader of the National Assembly, swore himself in as interim president of Venezuela, offering a direct challenge to President Nicolás Maduro, successor to Hugo Chávez and leader of the country since 2013. Guaidó was subsequently recognized as the legitimate leader by the United States and a host of other nations. 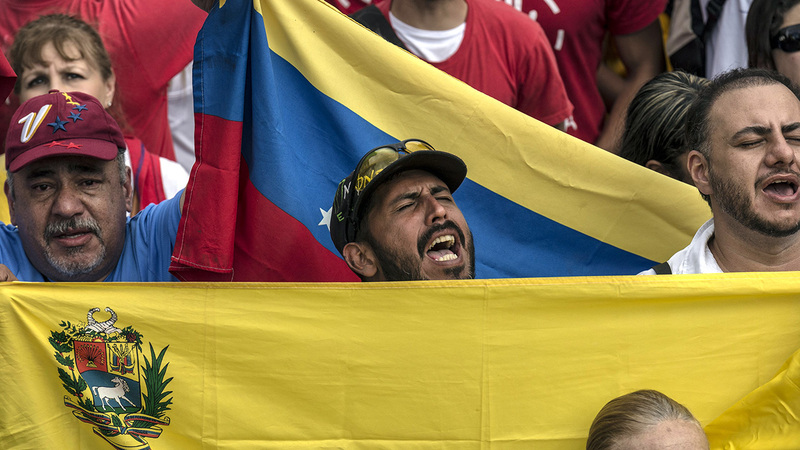 Maduro had won re-election last May amid charges of election fraud, and his administration has been besieged by a worsening economic crisis and a wave of nationwide protests. Only a third of Venezuelans trust their national government. Among the roughly two-thirds who distrust it, nearly four-in-ten (39%) say they don’t trust it at all. Younger Venezuelans and those with higher levels of education are slightly less likely to trust the government. Partisan differences are particularly stark. Those who identified as supporters of Maduro’s United Socialist Party of Venezuela (PSUV) when the poll was conducted are much more likely to trust the government than those who support other parties or have no partisan affiliation; 71% of PSUV backers trust the national government, compared with just 20% of other people. 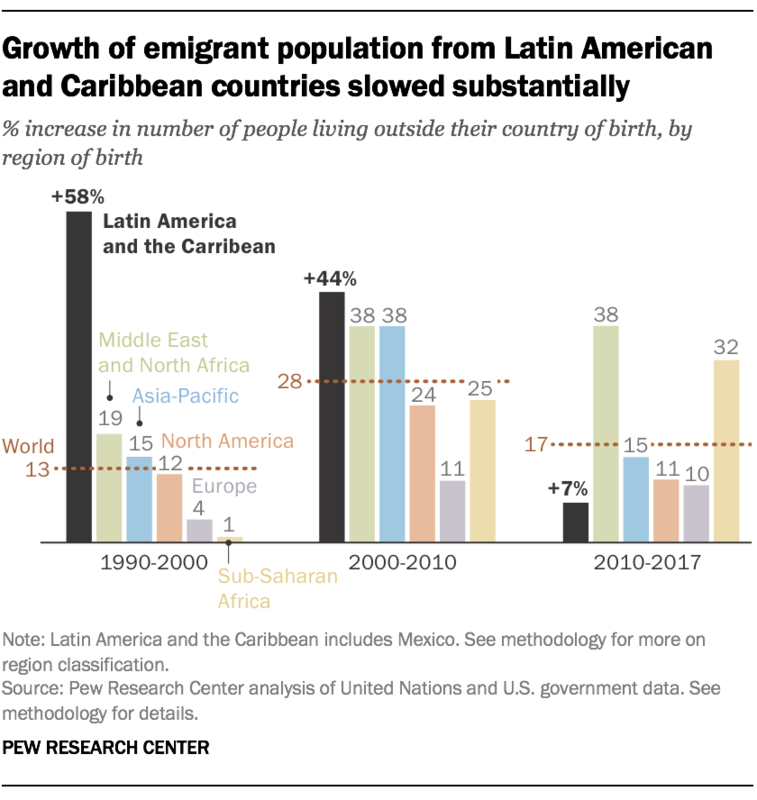 The global population of emigrants (people living outside their country of birth) from Latin American-Caribbean nations grew by 7% between 2010 and 2017, according to the analysis, which uses data from the United Nations and the U.S. Census Bureau. This is slower than the overall worldwide growth rate of 17% during the same period. Other regions, meanwhile, saw faster growth than Latin America during the period, including the Middle East and North Africa (38% increase) and sub-Saharan Africa (32%). 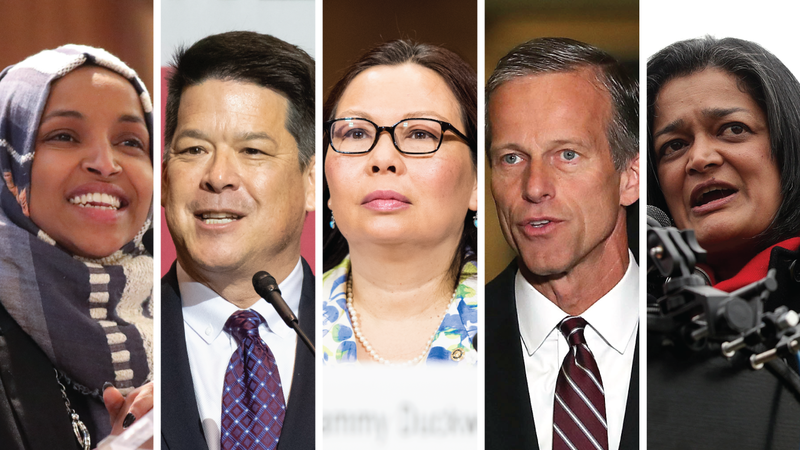 Politicians have long pursued the “Catholic vote” – a potentially big prize, given that the nation’s roughly 51 million Catholic adults constitute the largest single religious institution in the United States. But while Catholics once were more likely to vote Democratic, they have never been monolithic politically. Today, Catholics are evenly split between the two major parties and are sharply polarized, much like the broader U.S. public. Roughly equal shares of Catholic registered voters have identified with or leaned toward the Democratic and Republican parties in recent years (47% vs. 46%, respectively). And according to exit polls, nearly identical shares of Catholics voted for Democrats (50%) and Republicans (49%) in 2018 elections for the U.S. House of Representatives. White Catholics are more likely to vote Republican, while Hispanic Catholics overwhelmingly back Democrats. (Most American Catholics are either white or Hispanic. Black and Asian Americans each make up roughly 3% of the U.S. Catholic population, according to the Pew Research Center’s 2014 Religious Landscape Study.) Collectively, however, Catholics essentially balance themselves out at the polls on the national level. Meanwhile, when it comes to a number of specific issues – including some on which Catholic teachings leave little room for doubt – Catholic partisans often express opinions that are much more in line with the positions of their political parties than with the teachings of their church. Take abortion (which the Catholic Church opposes), for instance: Among Catholic Republicans and GOP leaners, 55% say abortion should be illegal in all or most cases, identical to the share among all Republicans. At the same time, 64% of Catholic Democrats and Democratic leaners say abortion should be legal in all or most cases — slightly lower than the share for Democrats overall (76%). On balance, however, Catholic Democrats are more likely to favor legal abortion than to oppose it. Partisan dynamics also are at work regarding views about climate change. Pope Francis has expressed a need to act on the issue, and like Pope Francis, eight-in-ten Catholic Democrats (along with 78% of Democrats overall) agree that the Earth is warming mostly because of human activity, such as burning fossil fuels. 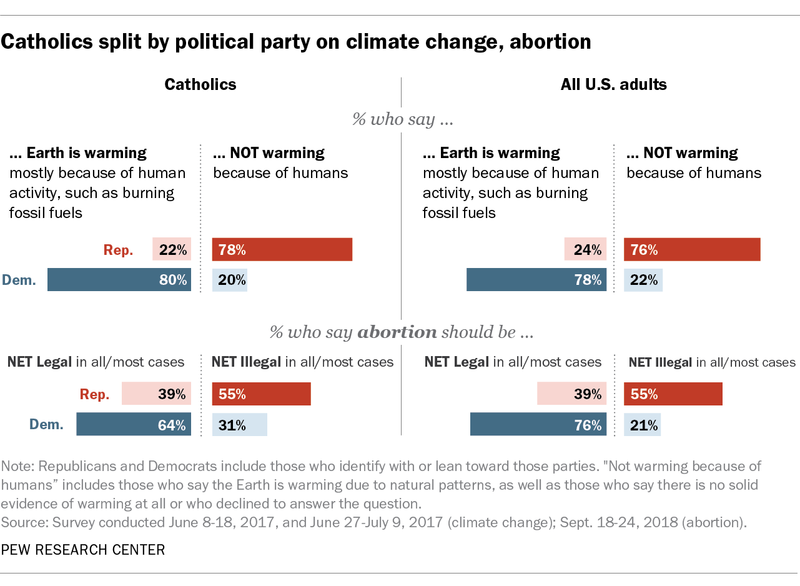 But just 22% of Catholic Republicans (and 24% of Republicans overall) say they believe the Earth is warming because of human activity. New guidelines from the American Psychological Association warning against “traditional masculine ideology” and a viral Gillette ad have sparked a national conversation about men and masculinity, with some saying concerns about masculinity should be taken seriously and others denouncing what they see as an attack on masculinity. 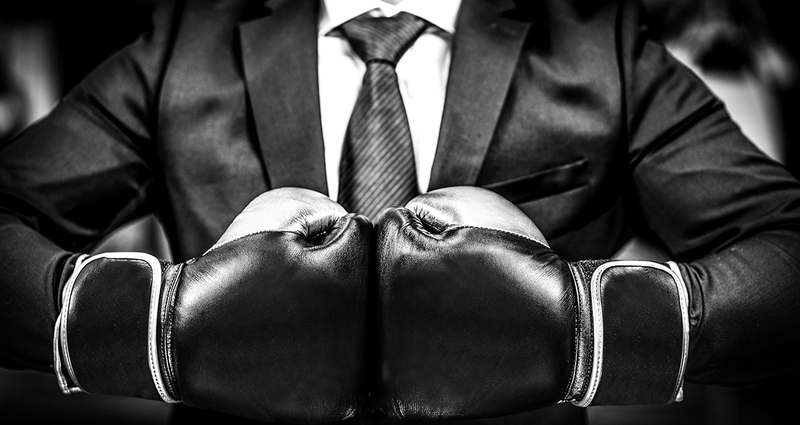 A 2017 Pew Research Center survey found that about half of Americans (53%) say most people in our society these days look up to men who are manly or masculine, with women more likely than men (62% vs. 43%) and Democrats more likely than Republicans (58% vs. 47%) to hold this view. 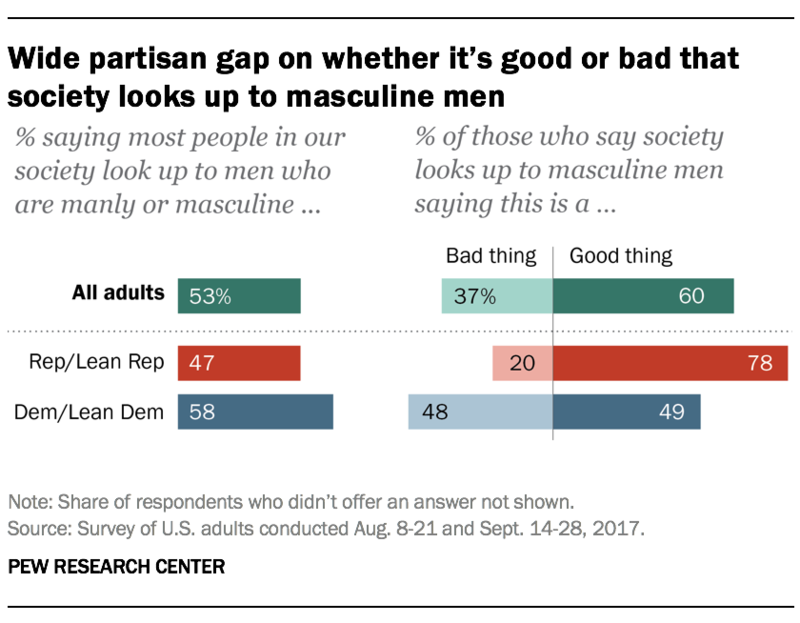 About two-thirds of men who say society looks up to masculine men (68%) say this is a good thing; a narrower majority of women (56%) say the same. Views differ more widely along party lines: Among Republicans and Republican-leaning independents who say society values masculinity, 78% say this is a good thing, compared with 49% of their Democratic and Democratic-leaning counterparts. Like so many issues in the United States these days, the partial shutdown of the federal government – now the longest in U.S. history – is viewed very differently by people in different partisan and ideological camps. In a new Pew Research Center survey, about six-in-ten U.S. adults (58%) call the shutdown a “very serious problem.” But Democrats and Democratic-leaning independents are far more likely than Republicans and Republican leaners to say this (79% vs. 35%). And within the GOP, 47% of moderate and liberal Republicans consider the shutdown a very serious problem, but only 27% of conservative Republicans do. About six-in-ten Americans (61%) disapprove of President Donald Trump’s handling of negotiations over the shutdown. An almost equal share (60%) disapproves of Republican congressional leaders on this score, and 53% disapprove of how Democratic leaders in Congress are performing. Other recent polls have asked who Americans believe is most responsible for the shutdown, finding that Trump and congressional Republicans bear more responsibility than the Democrats.